Everyone needs a refresher sometimes. 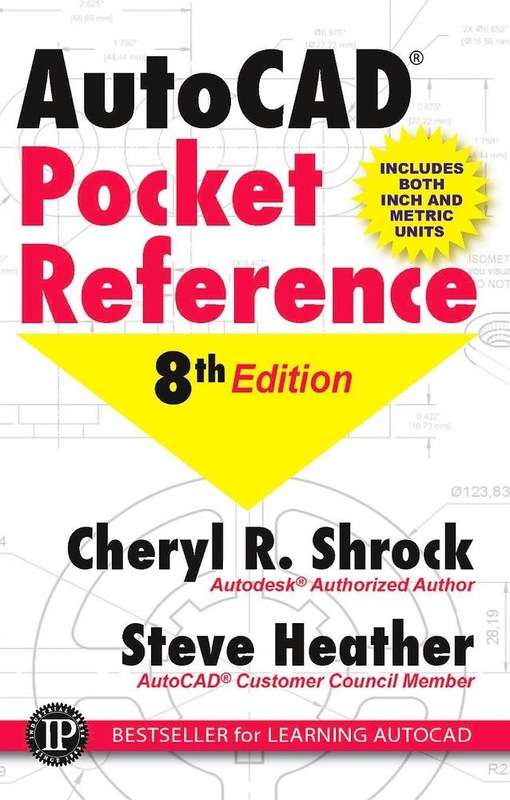 The 8th edition of the AutoCAD® Pocket Reference provides easy access to everyday information needed by AutoCAD users, including concepts, how-to, and fundamental commands. The pictures, explanations, and index are unparalleled by other references, as are the price and size. This 8th edition has been improved with the inclusion of both inch and metric measurements throughout to appeal to a more global audience. And now, with the inclusion of special "CAD Tips" throughout, this is the perfect "cheat sheet" reference, written by two of the foremost AutoCAD® expert teachers. ALL NEW “CAD TIPS” WOVEN THROUGHOUT FOR VISUAL ENGAGEMENT! For the first time, this time-saving resource includes “CAD Tips” throughout the book to further engage readers and provide valuable insider information from a longtime expert in the field. New and Improved Features Covers AutoCAD 2018 and 2019 software. All exercises will now include metric equivalents alongside the original imperial measurements. “Drawing Compare” and “Shared Views,” making working with clients and 3rd parties infinitely easier. New “CAD Tips” scattered throughout the book, providing shortcuts and suggestions from our expert author. Additional new features being released by AutoCAD to beta testers. Acquista AutoCAD Pocket Reference in Epub: dopo aver letto l’ebook AutoCAD Pocket Reference di Steve Heather, Cheryl R. Shrock ti invitiamo a lasciarci una Recensione qui sotto: sarà utile agli utenti che non abbiano ancora letto questo libro e che vogliano avere delle opinioni altrui. L’opinione su di un libro è molto soggettiva e per questo leggere eventuali recensioni negative non ci dovrà frenare dall’acquisto, anzi dovrà spingerci ad acquistare il libro in fretta per poter dire la nostra ed eventualmente smentire quanto commentato da altri, contribuendo ad arricchire più possibile i commenti e dare sempre più spunti di confronto al pubblico online.